What makes lentils French? The Cooks’ Thesauraus says that French lentils, or Puy lentils get their name from their original place of cultivation. They were grown in Puy, France, in volcanic soil. I have a general sense that volcanic soil would be extra rich in nutrients, and this article suggests that might be right. Still, I like French lentils because they are green, and also because they are little and cute. I think they taste earthier and more complex than red lentils, and I love that they hold their shape and texture when they’re cooked, instead of turning all mushy. 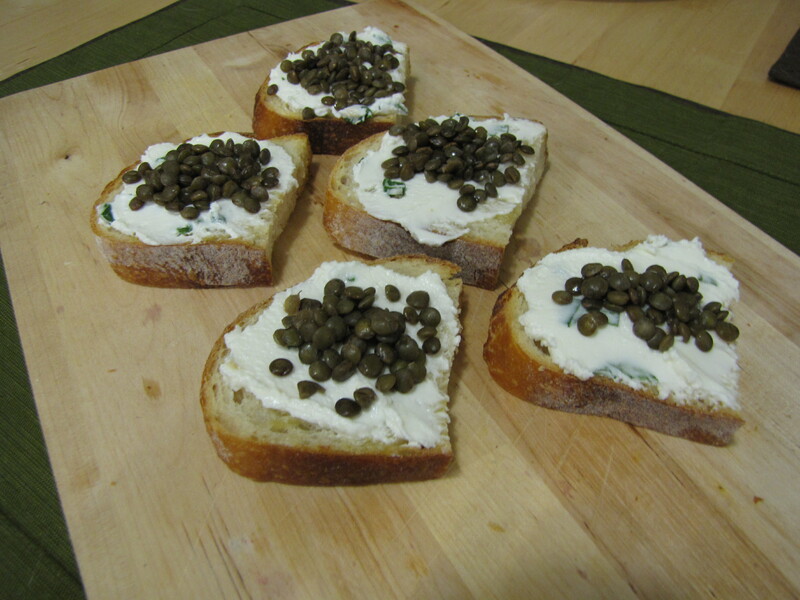 In Heidi Swanson’s Supernatural Cooking she has a great recipe for crostini with goat cheese and french lentils. I cooked the lentils in some roasted veggie stock and was truly amazed at how flavorful they were. The goat cheese spread is just goat cheese mixed with a little milk until it’s easily spreadable. Heidi’s recipe calls for chives, but I just used some chopped scallions for color since I didn’t have chives (I really have to get on that whole herb garden thing). To me, goat cheese tastes fresh and bright and tangy and matched perfectly with the lentils. We absolutely loved this. It was simple but incredibly flavorful, and the crostini disappeared so quickly. These were a much bigger hit with us than the risotto that followed (Meyer lemon does not always directly sub for lemon, who knew?!). I kept finding myself standing over the pot of lentils on the stove and sneaking spoons. I think that cooking them in veggie broth definitely added to the depth of flavor. The following night for dinner, I toasted some cubed sourdough to make croutons, and topped it with lentils, a little goat cheese, and a fried egg. It turned the crostini into a perfect meal, but I was a bad blogger, so you’ll just have to imagine. Rustic, golden sourdough croutons, with the contrast of tiny dark green lentils. Little crumbles of goat cheese that melted from the heat of the lentils, and a fried egg with lacy, crispy edges, and a sunshine yellow yolk that just makes you smile as you break it open. It was a simply wonderful dinner. This entry was posted in Uncategorized and tagged goat cheese, lentils. Bookmark the permalink.